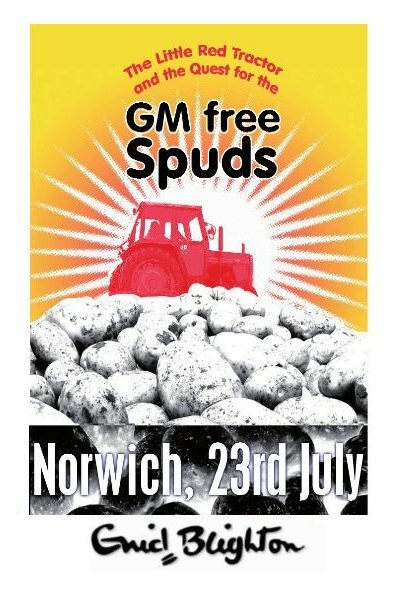 British trials of genetically modified blight resistant spuds have been failing for the last ten years. But a conventionally bred variety of blight resistant potatoes has been available for 3 years. So why are we still paying for their dangerous experiment? Come ride with us on the back of a trailor load of safe effective spuds as we go to deliver them to the Sainsbury Laboratory outside Norwich. It’s one of only two possible open air trials for GM crops in Britain this year. Yet despite being publicly funded, it’s so secretive no one will even say if it’s been planted. Join us for tunes, chips and good cheer as we go and show them that we have already got the answers they say they’re looking for. A day long camp to get productive and plan the next stages of the campaign. Camping spaces available from Friday afternoon. Come equipped with a stove and food for self-catering. The site is five minutes from a regular bus route to the city centre. Contact info_AT_stopgm.org.uk as soon as possible and by Friday 15th July at the latest to let us know you want camping spaces reserved for you. This project is being worked on by Stop GM in conjunction with the Genetic Engineering Network. Several experienced grassroots campaigners will be working on the project from now until the event, but we need help getting the word out. If you think you could help by distributing email information about the event, dropping it about in any social media you may be involved in, letting your local growing projects or social justice groups know, distributing our soon to be produced ‘Little Red Tractor and the Quest of the GM-free Spuds‘ leaflet or even organizing a coach to attend from your area, we’d love to hear from you. For more background info, see the Stop GM website. < Nonviolence for a Change	> Catching up…..